… and this one is about the FAMILY. No, not of the Corleone Connections, or even the Dynastic Dumbos, but of those who truly are , more that humans ever possibly could despite being born to the same parents (humans, I mean). The kindest, and the darlingest, the cuddliest, the peskiest, the charmingest, the most appealing, and the most loving of all…. and there I mean the unconditional sort! We’ve always had pets, right from when we were young. Mom used to grumble about having to look after them but we all KNOW for a fact that she was their most ardent supporter and defender, no matter what she actually said ! 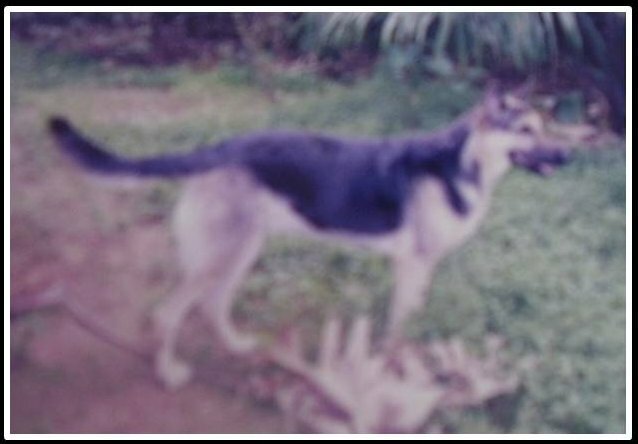 Growing up, we had a mixed breed called Judy, who met an untimely death, when she was left with my grandparents in Kerala for a couple of weeks. Run over :(. 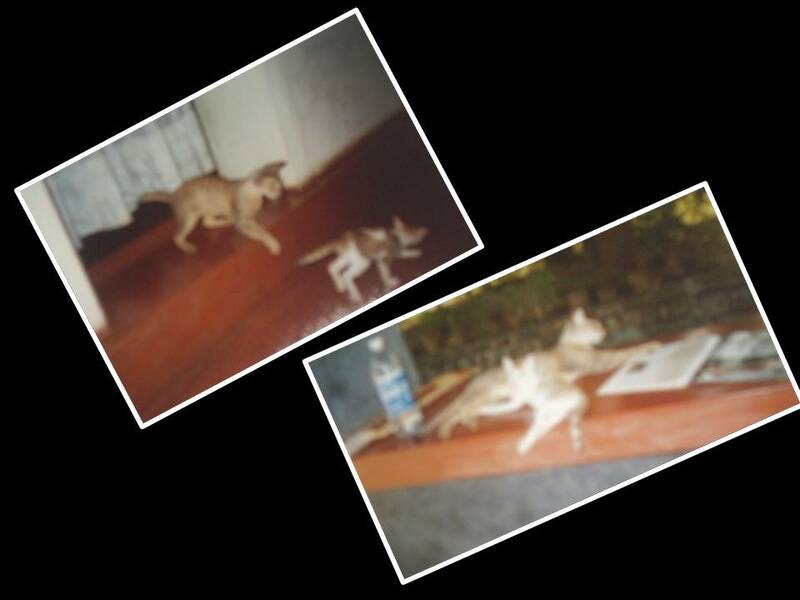 We had Brownie, the cat who shifted with us from our house in Jayamahal Extension, Bangalore, to Rajmahal Extension, about 4 kms away; but returned, to the old house, in a couple of days, on his own. He never did return to us, though he remained looked after by the next lot of tenants. Thank God for small mercies! 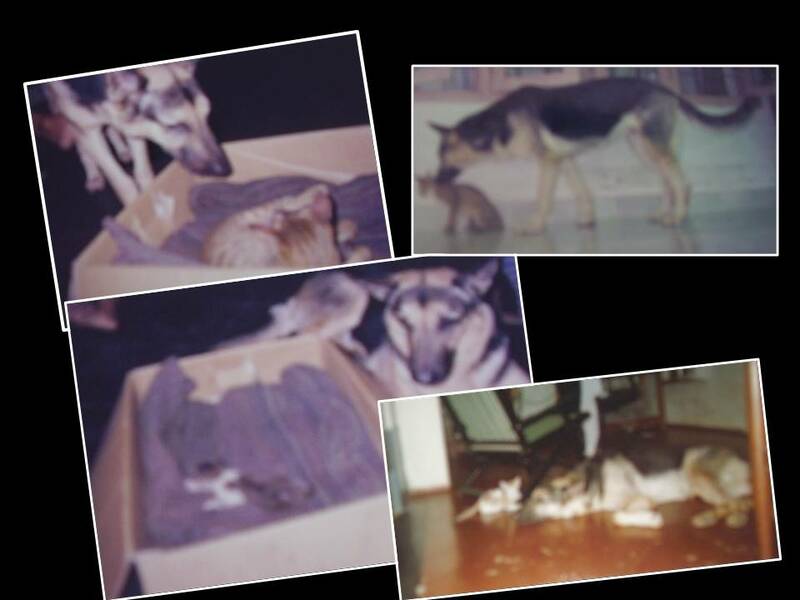 Then came Bunny, the pitch black Labrador, and Dusty, a sand coloured Alsatian Puppy. Bunny was wildly excited, enthusiastic, my YB’s best buddy, and died tragically in 1984. He was spooked while on a walk, ran off, and returned with a serious wound a few days later. There was no hope for him, as septicemia had set in, and he had to be put down to relieve him of his agony. He was just six. Dusty, a few months old, passed on because of food poisoning. That was in early 1984. 26 years ago. 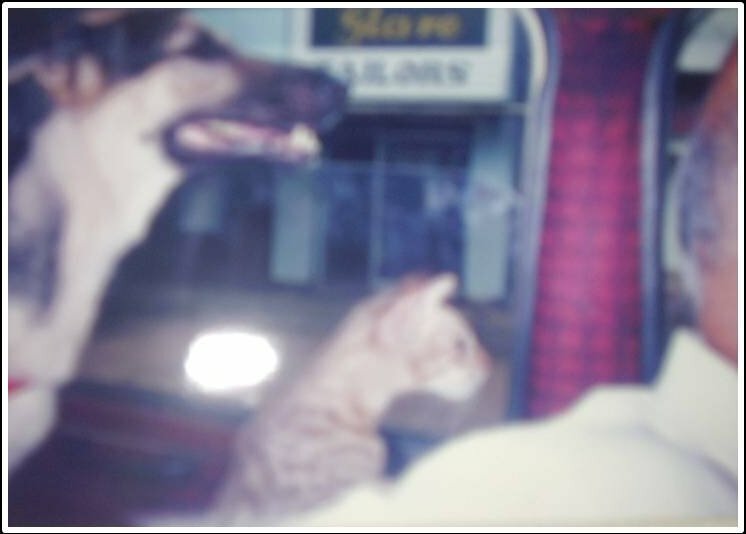 A year later, because we really missed having someone more, we got a pair of miniature Alsatians, Tiny and Caesar 🙂 They were loving too, but since Dad got a transfer to Bombay, and could not really manage to take them there, they were adopted by a friend, and were well taken care of. Luckily. After that, the thought of losing someone that we were all so attached to, was tough. So we never got around to having either dog or cat for a very very long time. It’s really hard, as I know, most of you do know too, losing them; just as it is to lose a member of the family. And so we come to Ammini and Kunhji 🙂 Ammini came to us in 1999. An adorable Alsatian pup; we brought her from my YB’s friend’s place, where her dad KUNJU was ruler of the roost 🙂 By then, my parents had settled in Cherplassery, dad’s home, and a spate of burglaries around the place, the most recent being their neighbour, prompted them to consider getting help with alerting them to such situations. As Dad put it, not so much to guard or attack, but to know if someone who should not be around is there 🙂 🙂 Very true, even for me, nowadays. And so came Ammini. She has been perhaps the most human of all the souls of our extended family, more human than a lot of people, friends and relatives I know 🙂 She had a gentleness that was so part of her personality. A way with kids, a way with the kitten my mother found abandoned nearby, and brought home. That’s Kunhji. The cat. 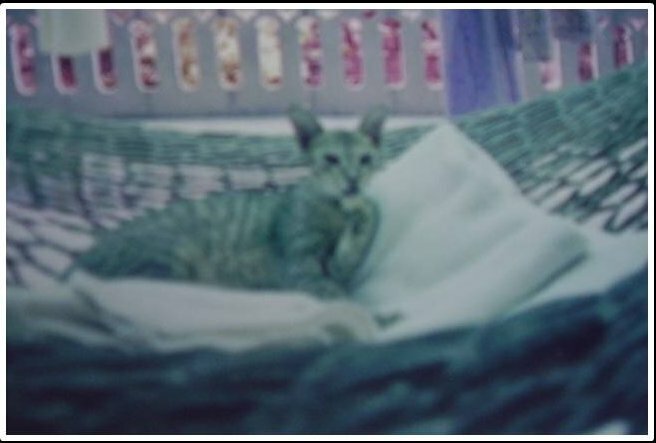 Kunhji, reclining, empress of the Hammock! Together they had a life that was quite exceptional. Ammini was adored by our neighbours, friends, relatives, the kids’ friends, babies, children, even those who were afraid of dogs would find themselves petting her quite delightedly. But that did not mean she was a cakewalk for anyone to get by her. She knew who was who. Dogs, they say, can sense. And she was an epitome of this sensibility. She sat through Kunhji’s labour, and delivery, 😛 taking very good care of the kitten too; though she never had any of her own. The picture below, though not very well taken would perhaps give you a glimpse into the nature of that loving souls. Souls. Kunhji too. Kunhi had three litters of kitten. One kitten in each of them. The first survived only a few weeks. The second, whose picture you see, was, again, born in my house (I tell you, I have been midwife to both cat and dog- seriously! More on the dog midwifery later 😀 ) With her second kitten, a strange thing happened. They were at home with my mother and Ammini, when one evening, a sound was heard from upstairs. Till five minutes before that, mother and daughter (Ammu, Kunhji’s daughter ) were playing near Mom, with Ammini. A bit after that sound, Mom went to investigate, and found nothing. But ever since, Ammu was not to be seen. Ever. Mom with the help at home scoured the entire house, and neighbourhood, sent word to everyone living around, and looked for her, for days on end. She never was seen again. It was tragic, again, that none of Kunhji’s litter ever lived beyond a few months. But she still stayed close to Mom and Ammini, travelled with us, and very unlike a cat, stayed with us on the travels between my parents’ home and ours. This is one other reason I firmly believe in re-incarnation, for I am sure she has been and always will be family, in any lifetime we happen to be in! As with Ammini! In 2005, Ammini suddenly, one day, took ill. Her hind legs turned weak and before I could get there, and get help on the way, she died, in mummy’s lap. The vet. believes it could have been a heart attack. She was in her prime. And had nothing else to show for any kind of ill health. To say that it was tragic is an understatement. Even when I think of it, or speak of it, I choke up. As I am now. Mom almost went catatonic. I have never seen her grieve so. Never, even after that. She went into a sort of depression that was very hard for her to recover from; she left home to be with her sons for a few weeks, but nothing could blot out the misery, till finally she took hold of herself. Being the strong person she is, she finally let Ammini go. But by now, she needed someone else. Dad was away on an assignment, so we got Appu, a lanky boisterous Alsatian; just two months old. Mom finally learned to get over Ammini, but she will have a place in our hearts like none before or after her. Categories: അമ്മിണി, കുഞ്ഞി, Children, family | Tags: അമ്മിണി, കുഞ്ഞി, Children, family, Kitten, Love, pets, Pets | Permalink. One elluva post mma!! 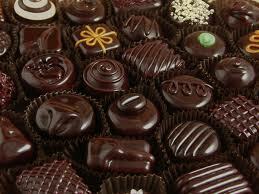 great loved it to the core..!!! All that we’ve had in mind about ammini and kungi has come out!! Kudos!! Aww Usha. Loved reading about Ammini and Kunhji. I have still not gotten over that loss of Goofy 😦 Pets are part of us. Sigh. Thanks Shail 🙂 I can understand that feeling. It’s been years since Ammini left us, and we have others now, but her going away still has not been completely accepted by any of us! And Kunhji’s too. Really mysterious. Thank you 🙂 For the kindness of your words, and the comfort you share. I am really choked after reading this Usha mam…i could feel every emotion u felt regarding ur extended family members.. I too have a cross breed who is part of our life for the past 11 years. Now a days she is not keeping well, and i dread every walking moment of my life. Every member of my family is very attached to her. Corinne, thank you too, for having dropped in here 🙂 I remember the post you had shared about picking up the little one that was to be part of your family, and the pictures you had posted 🙂 How is he by the way? Touching, is all I can say!! How loving Ammini was!! when I hurt myself she licked my tears away!! Anu, absolutely! She was a darling, wasn’t she? In fact, while going through the old albums, and picking out her pictures, it was both a joy and deep sadness, most esp. for the way we miss her even now! Thanks for being here, and sharing in these memories again! (((hugs))) Reading this brought a huge smile. There were so many places where memories came rushing back. Of all the family we have adopted over the years, Ammini and Kunhji stand out, not for the warmth they shared between themselves, but for what they meant to us. Even now, we, none of us, like to say “dog” or “cat” for these members of our family 🙂 We insist that they be referred to by their names. I want my kids to grow up surrounded by the very same warmth Ushus. These little beings are angels of god . They come to heal us I think. In ways we can never understand. People who love animals are the most darling people in the whole world . They have a heart of gold. What more is left to be said? That is why they are. Angels. And sometimes way more beloved that any thing else 🙂 And yes, I see 🙂 🙂 What a beautiful heart you have!!! 🙂 🙂 Knew you’d know, right away!!! So beautifully said! Have you got anyone else at home, for your mom? After Ash? I keep wondering. It’s like if you miss one baby of yours, having another one around is not the same. Never. That baby comes with those… those… feelings and all the inexplicablel things that surround it 🙂 Thank you, Megs, love your being here. Much hugs pet lover !